With the harsh rule of The Authority, presided over by the Warden, an unenviable economic status and a 2:1 ratio of men to women, Luna is a powderkeg waiting to blow. All it needs is a spark, one provided by a meeting of revolutionaries which is bloodily interrupted by the Warden’s overzealous guards. Among those fleeing are the intellectual insurrectionist Professor Bernard de la Paz, a visiting sister of the revolution known as Wyoming and Manny, a humble electronic technician who has just stumbled upon and befriended the world’s first sentient computer – one which just so happens to be responsible for overseeing all of Luna’s computerised infrastructure. What follows is a wonderfully ridiculous tale of revolution as the moon’s oppressed masses rise up, under the guidance of our three protagonists and their AI friend Mike, shaking off the shackles of Earth’s distant government and forging their own rule. Utilising Mike’s localised omniscience and ability to evaluate millions of potential outcomes seemingly simultaneously, the lunar government is swiftly overthrown. Earth is none too keen on this turn of events, particularly since they now face the prospect of paying true market prices for the food their former slaves provide. Fortunately the new ruling committee have an ace in the hole in the form of the enormous catapults used to launch grain shipments. Luna is not short on rocks and it’s a long, long way down. One of the joys of reading Heinlein is the absurd attention to detail and the sheer plausibility and levels of knowledge he brings to near any subject he touches. For starters, The Moon Is A Harsh Mistress could almost have been marketed as The Idiot’s Guide To Revolution. Every step of the way the innermost thoughts of those engineering Luna’s freedom are illustrated, alternatives discussed, reasoning tested and scrutinised. Obviously to any graduate of history or politics it will seem simplistic and flawed but for the lay reader there are many lessons to be gleaned here, from economics to group psychology. The discussions of technology are similarly thorough. From the habitations used on Luna to the catapults and spacecraft featuring later in the novel, nothing is merely glossed over. To be fair Heinlein wrote The Moon Is A Harsh Mistress in 1966, well before the digital revolution. With the benefit of hindsight his depiction of Mike is comically dated but his insights into AI itself and the concept of consciousness as a complexity-dependent emergent phenomenon were well ahead of his time. The only nagging point I have with the novel is his political views. 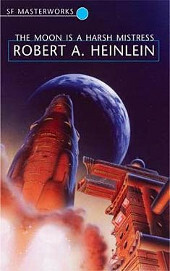 Heinlein is an unashamed fan of Ayn Rand, who I believe to be one of the most despicably amoral writers in history, skewed against humanity and fetishising selfishness to an almost psychopathic level. Indeed he goes so far as to namedrop her fictional hero, John Galt, in his discussion of worthwhile role models. The Moon Is A Harsh Mistress is drenched in Libertarian thinking, taking the idea of personal freedom too far and forgetting that government can be extremely useful in protecting the powerless from those who would wish to exploit them. His comments that taxation is the ultimate and vilest form of theft had me alternately in fits of laughter and reaching for the sickbag. This personal point aside it is an astonishingly easy read for a book with such ambitious scope. After a dragging first fifty pages I was rattling through it at a pace which kept increasing until I hit the back cover. Definitely a book to reach for if you want something which will give your grey matter a workout while entertaining at the same time. In Soviet Russia, book writes you! It’s 1946 and Soviet Russia is piecing itself back together after the horrors of World War II. When a group of eminent science fiction authors are rounded up for an audience with Josef Stalin they are understandably nervous. Has their art offended the great leader? 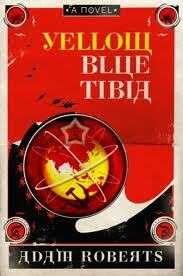 Is sci-fi now deemed anti-Communist? Thankfully their situation is far less dire. Uncle Joe has been pondering the future. With Germany’s downfall and the inevitable, imminent collapse of the Capitalist USA the future for Russia looks bright. But something is missing. The people of the world need focus, an enemy to unite against, and what better than a terror from outer space? Thus charged, the group commence to cap out in the dacha which will become their home. Alien civilisations are born and destroyed overnight, invasion plans drafted and technology advanced. Until suddenly the word filters down from on high that the operation is over; no explanations, simply a warning to forget what had transpired and never speak of it again. Flash forward to the 1980s, the era of Gorbachev and glasnost. Konstantin Skvorecky, one of the cadre of writers, is battling the demons of alcohol and depression following the collapse of his life. Things are about to get a whole lot worse when the imaginative figments of four decades ago start coming to life all around him. In Yellow Blue Tibia, Adam Roberts takes this convoluted premise and proceeds to twist it into every imaginable shape. In this wonderfully sharp and satirical take on the paranoia engendered by the Soviet machine we find absurdist humour and espionage action melted together in a fashion which would make David Lynch proud. Roberts subjects his protagonist to a gruelling journey. First comes a bizarre meeting with two Americans which leaves a sour taste in his mouth. This is followed by a series of ‘chance’ encounters with his former colleague Ivan Frankel, now apparently a government apparatchik. Frankel is apparently convinced that the scenario penned in the dacha after the war is now coming true, and it seems the Americans are of the same opinion. Before long the hapless Konstantin is being hounded by the KGB, the local police, an army of UFO enthusiasts and an insane taxi driver with no sense of social etiquette but uncannily sharp timing. All seem convinced that he is at the centre of events and his protestations to the contrary only fuel there beliefs in a Kafkan or even Pythonesque manner. With seemingly no control over his own destiny he is thrown from Moscow to Kiev to the heart of the Chernobyl power station, in and out of prison cells and ultimately unable to determine whether the whole charade is real or just the final collapse of his sanity. The events of Yellow Blue Tibia play out as a memoir, Konstantin’s document of the invasion of the Soviet Union, a conceit which allows Adam Roberts considerable leeway to have fun. The atmosphere in the Russia he creates is perfect, embodying all the contradictions which began to surface as Communism started to crumble and Western influence began to creep in. Throughout the book he toys with your sense of reality in every way possible – is the invasion real or did the KGB stage it? Or was it the Americans? Who is on Konstantin’s side, if anyone? And what does anyone stand to gain from the situation? Despite taking a while to find its feet – I confess, I was tempted to give up after fifty pages or so – Yellow Blue Tibia soon takes off and from that point on doesn’t lose its momentum. The various sub-plots loop around each other, always threatening to tangle beyond repair but finally reaching a suitably odd yet satisfying conclusion. And underneath it all is, as always, a rather tender love story as Konstantin rebuilds his life and prepares himself to strike out into the word again. The book may seem muddled at times, too much information being crammed into too small a space, but this does have the advantage of broadening its appeal. There’s something here for lovers of science fiction, thrillers, Russian themes and anyone who simply enjoys a beautifully written and thoroughly original tale. You can buy Yellow Blue Tibia here.